It’s easy to accept online payments with our free payment module for HikaShop. Since ePay is integrated into HikaShop, you don’t need to download or install any files to use the ePay module. All you need is an account with ePay. Follow 3 simple steps to accept payment cards online. The first thing you have to do before trying the module is create a test account with ePay. It’s easy, completely free, and only takes a few minutes. When you’ve created the account, you’ll receive a test merchant number which is used for making test payments through the module. Please state that you want a test account in the comment field. When you’ve tried the module and are ready to accept real payments, let us know and we’ll upgrade your test account to a production account. This way you don’t have to create a new account. 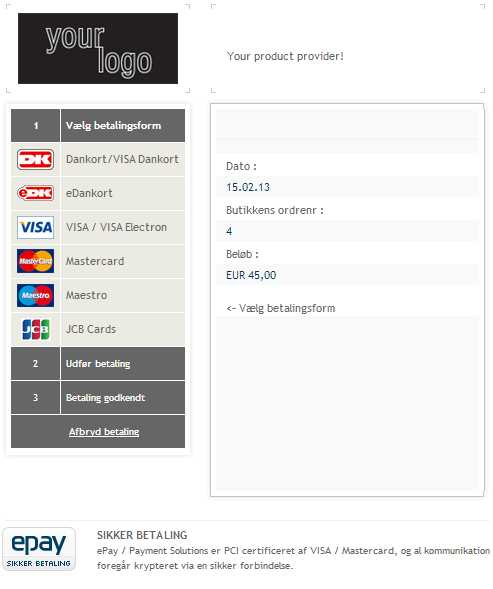 Open HikaShop, and go to the menu System -> Payment methods. 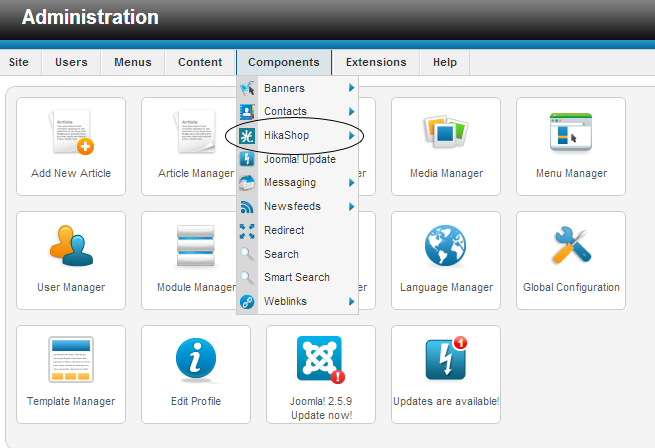 You might have to choose Components -> HikaShop to go to your HikaShop administration. 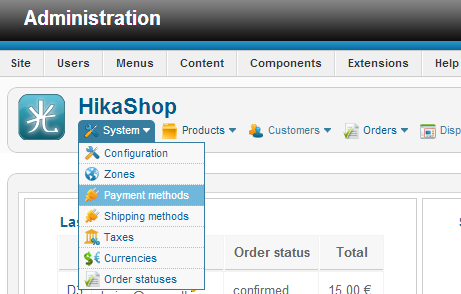 Click on “HikaShop ePay payment plugin” to configure the module settings. Enter your merchant number in the field “Merchant Number”. It’s either a test or a production merchant number. Press the button ‘Save & close’ at the top of the page to save the settings. Press the icon in the column Enabled. The icon turns green, and the module is now active (see image 3). The domain from which you’re testing must be registered in the ePay administration in the menu Settings -> Payment system. If the domain is not entered correctly, ePay cannot open the payment window and show it to your customers. Make a purchase in your store to test the module. Choose Pay using creditcard at checkout. Find an example of ePay’s payment window in image 4. You can add your own logo and company information at the top of the window. Do this from the ePay administration in Settings -> Payment window. The customer chooses between all the payment methods you’ve activated in ePay. 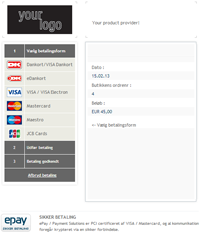 When the payment is completed, and the customer closes the payment window, a HikaShop confirmation page is shown (see image 5). This completed the payment process. You’ve received the order, and ePay’s received the payment information.